Given the chance to perform and achieve her potential. Ruth is the fifth of seven children in a musical family. Because of SYF, she was able to perform at the World Harp Congress in Vancouver, where she represented the United States. The World Harp Congress is an international gathering of the world's finest and most famous harpists. It occurs every three years at varying locations. At the week-long Congress there are concerts featuring harp solos, ensembles, full orchestral concertos, and workshops. One special part of the Congress is Focus on Youth. These special concerts feature young people under the age of 21 and it is a huge honor to be invited to perform. Just 26 performers from 23 different countries were granted a feature solo – including Ruth. When she first learned that she was selected to be featured, Ruth started investigating the costs. It was quite discouraging to her and her family to discover how expensive it would be to attend. She did extensive research to find some way to afford the trip. She found dozens of potential sources, but in the end, most were unfunded or only for high school seniors. Luckily, Ruth found SYF. During her featured concert, six professional harpists from all over the world provided Ruth with invaluable instructive comments. Their kind remarks and insights provided her so much benefit. 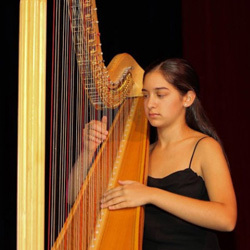 Performing at the World Harp Congress is something that will always stand out on Ruth's resume, and will be very important for acceptance to college or conservatory. It is truly a springboard to future success. Ruth is incredibly grateful to SYF for awarding her a travel scholarship and giving her the chance to perform. The experience was unforgettable for her. If she hadn't received funding from SYF, Ruth would not have been able to attend this incredible Congress. Enrich a child's life through travel.